These lovely Peace roses are beginning to bloom in my back yard. I love the the subtlety of the oranges and pinks that emerge from its petals. As soon as the paint was dry, this painting was listed for sale in my Etsy Shop. 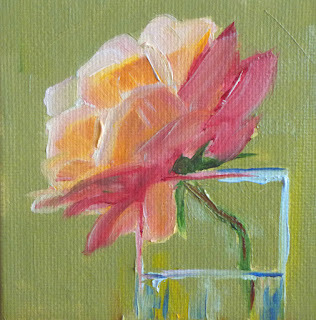 It is 4x4 inches on a canvas panel and was created with artists grade oil paints. 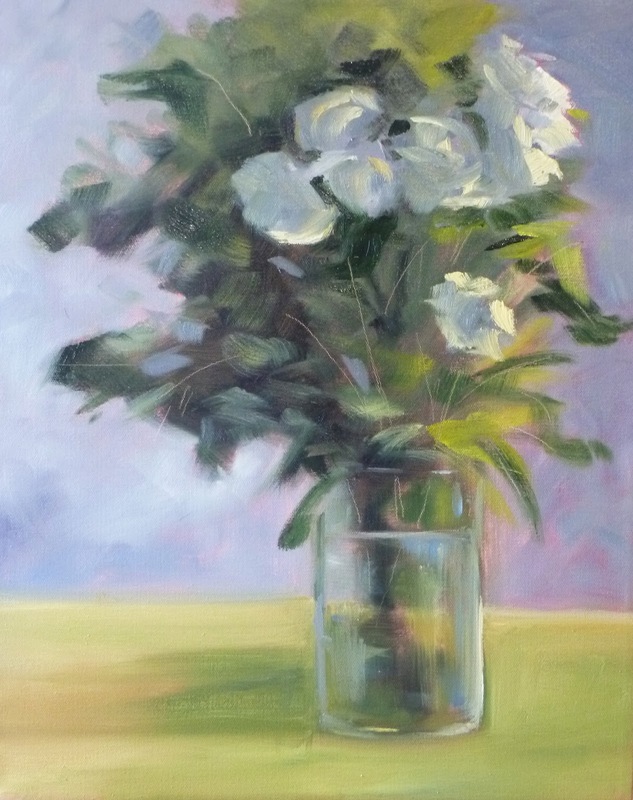 It SOLD in a very short time, but some of my other paintings of flowers are still available. It is fun to choose and arrange objects for still life work. 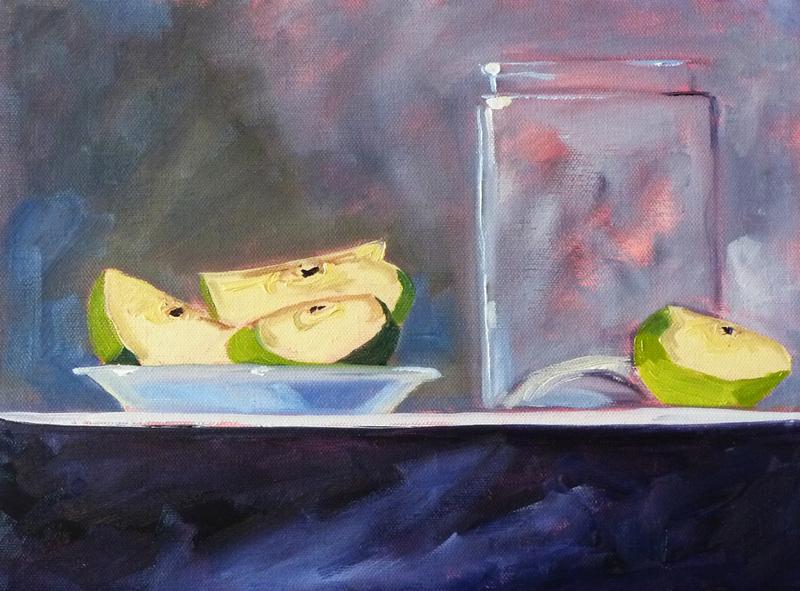 I've painted this square glass jar before, but this time there was a snack on site. Loved putting it all together. This 9x12 inch painting that resulted from my tinkering with objects. 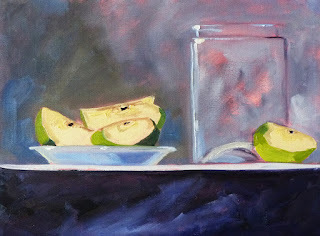 It is for sale with some of my other recent still life oil paintings at my Etsy Shop, Small Impressions Paintings. It has been a little over a week now since Mother's Day. I finally took the time to haul this wonderful bouquet into my studio and capture the light before the flowers and the foliage fade. The painting is 16x20 inches, larger than my usual, but so much fun to use big brushes and paint loose. So far, this has been a month of adventure and beautiful weather. I've traveled up and down the west coast, traveled east, and returned home again. To top it off, we've had an unbelievable six weekends straight with sunshine, unheard of in Washington State during the spring where we usually have nothing but rain. Luckily, the rain came only during the week and God left sunshine for everyone's days off on Saturday and Sunday. I haven't spent near as much time in my studio as I would like. It felt good to find some time to do just that. 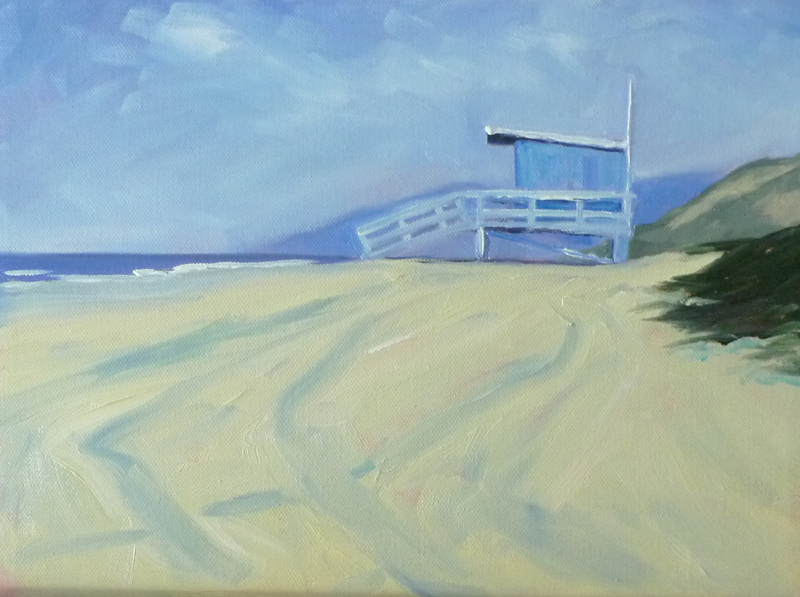 This 9x12 inch oil painting is a little life guard shack just north of Santa Monica in California. Yesterday morning was a delightful time in the studio recreating an adventure we had riding bicycles down the California coast. 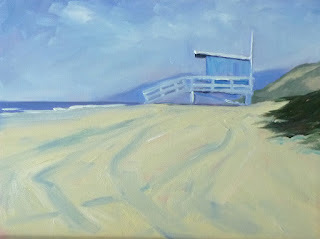 The painting SOLD at my Etsy Shop, but I have many other landscape oil paintings still for sale.